Hours later she received a text message from New York City’s Department of Homeless Services saying it didn’t have anywhere for her and her 4-year-old daughter to go. The following day, she joined about 50 people on the steps of City Hall, protesting their imminent eviction. Later that day Mayor Bill de Blasio announced the City would temporarily cover the cost of the hotels for Hurricane Maria evacuees. 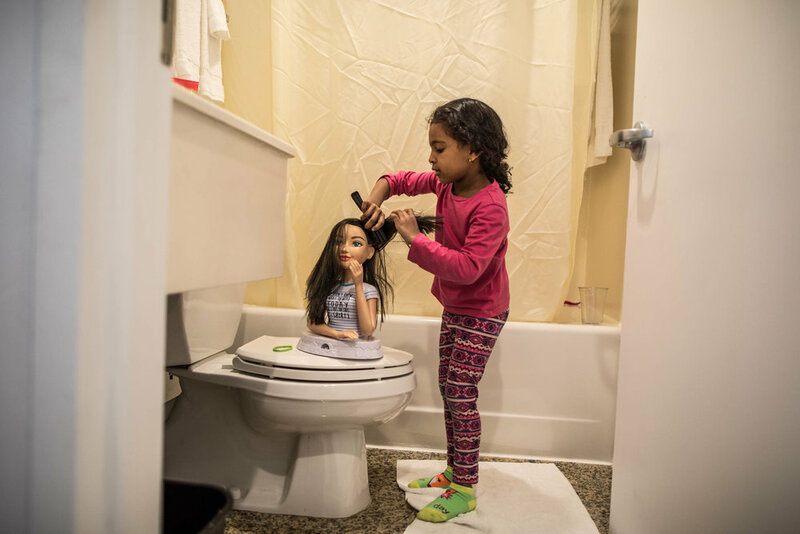 FEMA subsequently resumed paying the bills – but set a new expiration deadline of June 30, making the fate of Tejeda, her daughter, and 136 other Puerto Rican families currently staying in hotels in New York State uncertain. The only thing they’ve been told is that FEMA is offering tickets to fly them back to storm-ravaged Puerto Rico. But many families feel they cannot rebuild their lives in Puerto Rico because of the slow recovery from Maria. Power outages continue across the island and officials recently announced plans to permanently close 266 schools. The New York Disaster Interfaith Services (NYDIS), a nonprofit group, estimates there are still some 10,000 evacuees from Maria living in New York City. While many are staying with relatives, others have gone to City shelters. Peter B. Gudaitis, CEO of NYDIS, is calling on the State and City governments to do more to coordinate relief groups’ assistance and to help the displaced find jobs. “FEMA has fallen short when it comes to planning and responding for diaspora events in the United States,” Gudaitis said, adding that Puerto Rican evacuees face steep challenges. Many lack English language skills; a large number are senior citizens in poor health. “There is definitely a feeling that we have to hope for the best, but now we have to prepare for the worst,” said Luz Correa, chair of the Bronx Coalition Supporting Hurricane Maria Evacuees. She has been in touch with families at the hotels and said some are preparing to enter the City’s shelter system. Placement isn’t guaranteed, though. A spokesperson for the Mayor’s Office said it “will continue creating strategies to support case management for these families affected by Hurricane Maria,” but didn’t provide details. For Tejeda, survival in New York City is a daily struggle. She receives $352 a month from the City for food, but she’s been skipping lunch because she can’t cook in the hotel and nearby restaurants are expensive. She said she often eats nothing until a dinner of rice with ketchup and canned sausage. In San Juan, Tejeda lived in a two-bedroom apartment on the 20th floor and could see the ocean from her balcony. The hurricane broke all the windows and flooded her home. Her furniture, clothes, and her daughter’s toys were destroyed by mold and none of the apartments in Tejeda’s government-owned building have been repaired. Her salary as a clothing vendor decreased after the hurricane from $320 a week to $130 because the store was rotating employees to make sure everybody would be paid as business sagged. She has been bouncing from place to place since arriving in New York in December. Initially, she stayed in her uncle’s two-bedroom apartment, then moved to a shelter in Manhattan she says was infested with rats and cockroaches. On March 3rd, FEMA offered her a space at the Midtown Manhattan hotel in Midtown. Even though housing in New York City is proving to be more of a struggle than she imagined it would be, Tejeda, who has a degree in criminal justice, feels that going back is not an option. She wants to stay and become a police officer. “I want to study here,” Tejeda said. “I want to make progress here and give my daughter a good life.” In May she got a part-time job paying minimum wage in Queens. She said it would take her more than a month to save up for a deposit on an apartment. When FEMA stops providing temporary accommodation, she thinks she will have to try to go to a shelter. But is concerned a shelter can’t accommodate them. “As they say, there is no space for us there. I can’t be on the street with a 4-year-old,” she said. Paula Moura is a multimedia journalist from Brazil and currently a graduate student at the City University of New York. She has contributed to The New York Times, NPR, and Washington Post. THIS URBAN MATTERS IS ADAPTED FROM AN ARTICLE THAT ORIGINALLY APPEARED IN "LIFE AFTER MARIA: PUERTO RICO, CLIMATE CHANGE AND MIGRATION," FEET IN 2 WORLDS' latest online multimedia magazine. Fi2W is supported by the David and Katherine Moore Family Foundation, the Ralph E. Odgen Foundation, the J.M. Kaplan Fund, an anonymous donor, and readers like you.